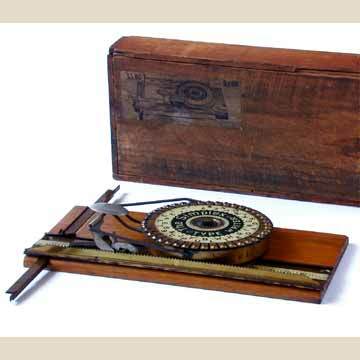 The Simplex typewriter is a famous toy, but in its first incarnation, it was intended to be a real typewriter. The Simplex has a round, tin index with rubber type mounted underneath. It is basically a simple stamping device. The Simplex 1, as seen here, was a machine that wrote capitals only. In 1895 an improved version appeared that wrote upper and lower case letters. Typical for these two models was the clamp that was attached to the wooden board, to hold the paper. Later, the Simplex was turned into a toy in enough different versions to use most of the letters of the alphabet to distinguish them by. Also see the book TYPEWRITER, page 150.